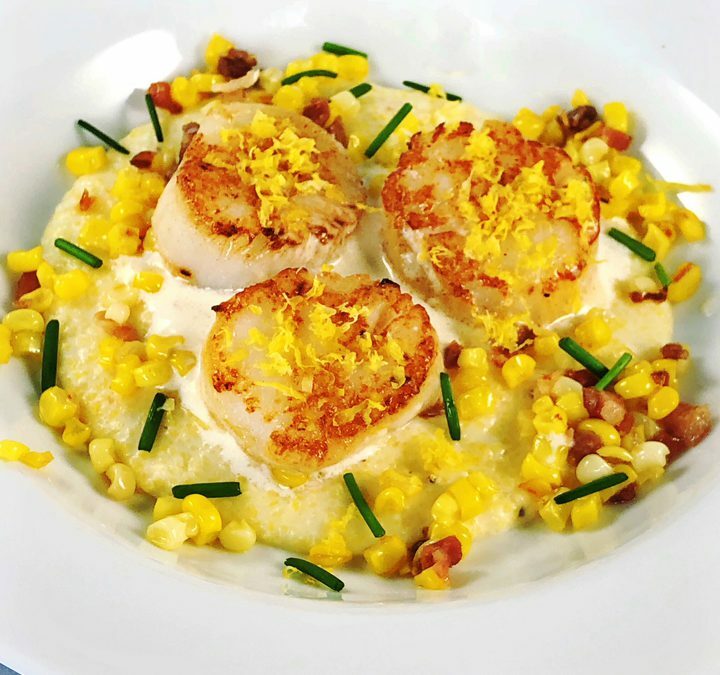 The perfect combination for a special summer dinner – pan-seared scallops served atop a bed of creamy cheese grits with seared fresh corn and prosciutto. To complement the scallop’s sweet, succulent flavor, we added a lemon butter cream sauce right under the scallops to make this pure meal luxury. In a saucepan, heat butter over medium temperature until melted. Slowly whisk in the cream and bring to a simmer. Whisk in the lemon juice, basil, and garlic. Reduce the heat to low and simmer for 8-10 minutes. Strain through a fine-mesh strainer into a clean saucepan to remove the basil and garlic. Cover and keep warm. Melt 2 tablespoons butter in a large sauté pan over medium-high heat. Add the corn kernels and prosciutto and sauté over medium-high heat until the prosciutto is lightly browned, and the corn is cooked through; set aside and keep warm. Rinse the grits, drain and remove any floating chaff and hulls. Bring 3 cups water and 1 ½ teaspoons salt to a boil. Add the rinsed grits and cook frequently stirring for 15-20 minutes. Reduce heat to low, add the cream and soda water, often stirring, until the grits are very thick, about 10 minutes. Add the cheese, remaining butter and pepper; stir to combine. Cover and keep warm while you make the scallops. Remove the small side muscle from the scallops, rinse with cold water and thoroughly pat dry. Set uncover on a paper towel lined plate in the refrigerator for 2 hours to dry the surface. Add the butter and oil to a 12 to 14-inch sauté pan placed over high heat. Salt and pepper the scallops. Once the fat begins to smoke, carefully add the scallops, making sure they are not touching each other. Depending on their thickness, sear the scallops for 2-3 minutes per each side. The finished scallops should have a golden crust on each side and be translucent in the middle. Ladle some cheese grits in a bowl. Top with the corn and prosciutto sauté and then sprinkle with chives. Add a little cream sauce; rest the scallops in the cream sauce. Top the scallops with lemon zest.